On Wednesday 27th CTH’s Chairman, Mr Simon Cleaver, and CTH’s Head of Operations & Compliance, Ms Sue Graham were delighted to attend the Summer graduation ceremony at Gordon Ramsay’s Tante Marie culinary school in Woking near London and present an award. 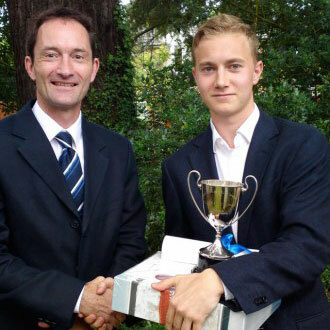 The ceremony was a very enjoyable event, that included various prize giving. At the graduation ceremony, CTH’s Chairman formally presented 19 year old Kristoffer Thygesen from Denmark with the schools coveted Tante Marie Student of the Year Award as part of the ceremony. Click here for more information on our Diploma in Professional Culinary Arts to get more information on our qualification.